How do you connect with people around the world? Technology has made communication far more convenient, but it has not been without limitations. Recently, however, a new language has changed things. Emojis, the colorful icons people use to inject more emotion and personality into their text messages, can be understood by all, regardless of their nationality, culture or smartphone operating system. 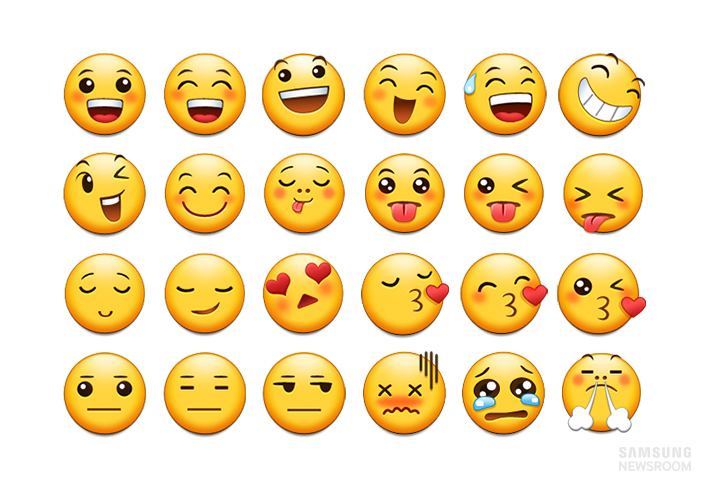 It was around 2010 that Samsung began to actively design emojis specifically for the company’s mobile devices. Its more recent efforts have placed a greater emphasis on reflecting consumers’ evolving communication habits in its devices. The Galaxy S6 edge+, released in August, introduced an enhanced People edge, a device-exclusive function that enables users to send messages, emails and emojis. 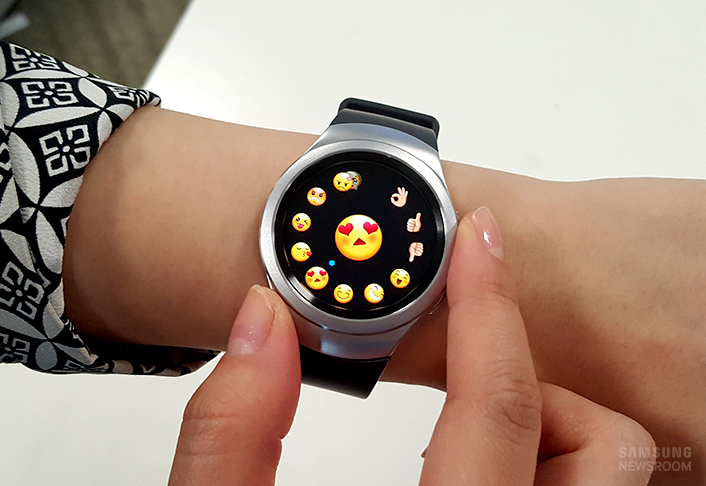 Likewise, the Gear S2 smartwatch gives consumers the option to reply to messages with emojis. There’s an emoji to represent nearly any mood, product or activity one can think of. But more than just cute characters, this ever-expanding collection of ideograms has come to be one of the most widely used forms of communication throughout the world, surpassing both language and generational barriers. Restoring the facial expressions and body language that we make in person but not online, emojis are quickly transforming the way we as humans interact in a digital world that is becoming more and more emotionally expressive and visually driven. The impact is so far-reaching, in fact, that the Oxford Dictionaries Word of the Year 2015 is not a word at all—it’s Face with Tears of Joy, the most widely used emoji this year. The emoji was not born overnight. In fact, its predecessor, the emoticon, paved the way for its entry into the digital communication space. Scott Fahlman, a research professor at Carnegie Mellon University, was the first documented person to use the emoticons 🙂 and 🙁 in 1982, when he suggested that they be used to express emotion. Almost two decades later in 1999, Shigetaka Kurita, an employee at Japanese mobile service provider NTT DoCoMo, took the emoticon a step further. Inspired by Chinese characters and manga, Japanese comics, he developed the first emoji prototypes in an effort to deliver the most amount of information as possible in a limited screen space. As the emoji quickly gained admiration across the globe, communications and technology companies began to develop their own designs. However, when users with differing devices attempted to send emojis to one another, the ideograms appeared as squares because they were not supported by the receiving devices’ operating systems. That’s when Unicode Consortium stepped in. As the non-profit organization that develops and maintains one of the major international text standards in computing, the Unicode Consortium created a global standard for coding emojis across operating systems in 2010. 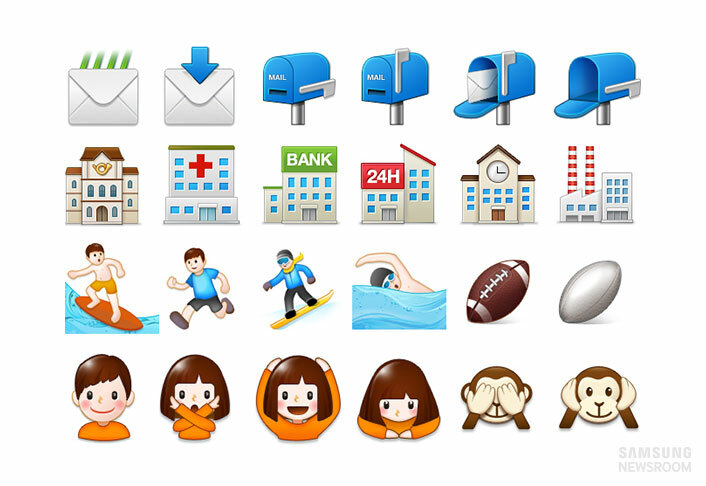 Most recently, the consortium approved a number of new emojis and emoji modifiers as part of Unicode 8.0 earlier this June in response to the growing demand for more current designs. Now, even though these specific emojis look slightly different across platforms, they can still be easily understood by the receiving user, regardless of their device’s operating system. 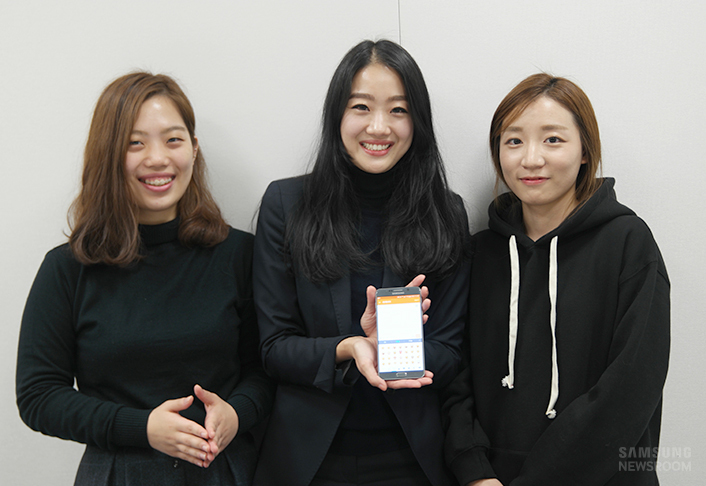 With such developments taking place, Samsung’s UX design team works relentlessly to continuously expand their suite of 1,200-plus emojis, all the while conveying the company’s unique identity in a variety of facial expressions, animals, buildings and signs. And, while many apps, both paid and unpaid, also offer an eye-catching but limited selection of emojis, Samsung’s suite—which is designed entirely by the company itself—can be accessed directly from the device’s keyboard and used in all the device’s services and applications when a bit of variation is desired. So what makes Samsung’s emojis different from the others? These uniquely Samsung facial expressions typically transcend national, religious and political boundaries—a necessary component of the company’s designs. Even when the emojis introduce a style distinctive to Samsung, it is essential to create images that can be understood by millions of smartphone users around the globe, a fairly arduous task considering that many emojis aren’t always interpreted in the same way. In addition to these obstacles, there are other limitations that make the design process challenging, like the amount of space the designers have to work with—a small square of 108 by 108 pixels. The limited area makes it particularly challenging when designing action emojis, which must be the same size of facial expressions but usually require more detail to properly illustrate the action. Moreover, creating a design that appeals to everyone is just as difficult. 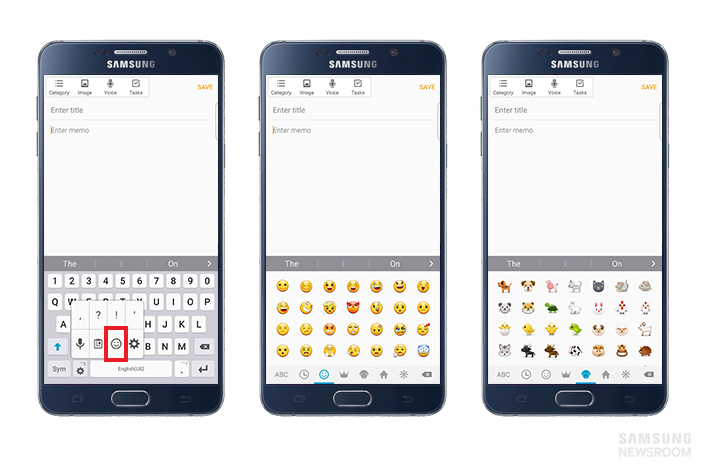 Users can utilize Samsung’s unique emoji suite by holding down the setting icon on the keyboard. Once a design is settled on, the designers work on individual graphics as they appear on actual screens. The designers must take into account how the emojis appear next to text and how the human eye perceives them. “To eliminate the visual discomfort that can occur when two-dimensional and three-dimensional designs are placed next to one another, we unify the angles and directions of light, composition and shading for each emoji so that they can easily be browsed by users,” Jung elaborates. Finally, the completed design is applied using the same type of code as the general font on the device so as to take up as little storage space as possible. In other words, the size of the emoji matches the size of the expressed font. The designers hope to soon implement a technology that allows for the adjustment of the size of the emojis exposed on the screen so that the user’s message, intended emotion and tone of voice are more accurately conveyed. Additionally, they hope that consumers will enjoy Samsung’s unique emoji designs so much, it will inspire them to choose Samsung devices. The importance of the emoji to modern language is clear. It is a necessary solution for expressing emotion and conveying meaning in an era where written language is limited in doing so. And, just as language evolves over time, it is certain that the emoji will transform, too, further developing the way humanity connects and interacts.